Well hello Storm Sandy. The winds and the rain have begun. I am not sure how badly we will be hit and whether or not we will lose power with this storm, but in preparation I made some treats. 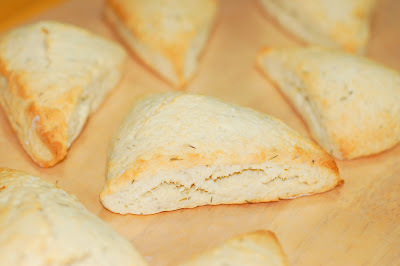 I made some scones since they are quick and easy. 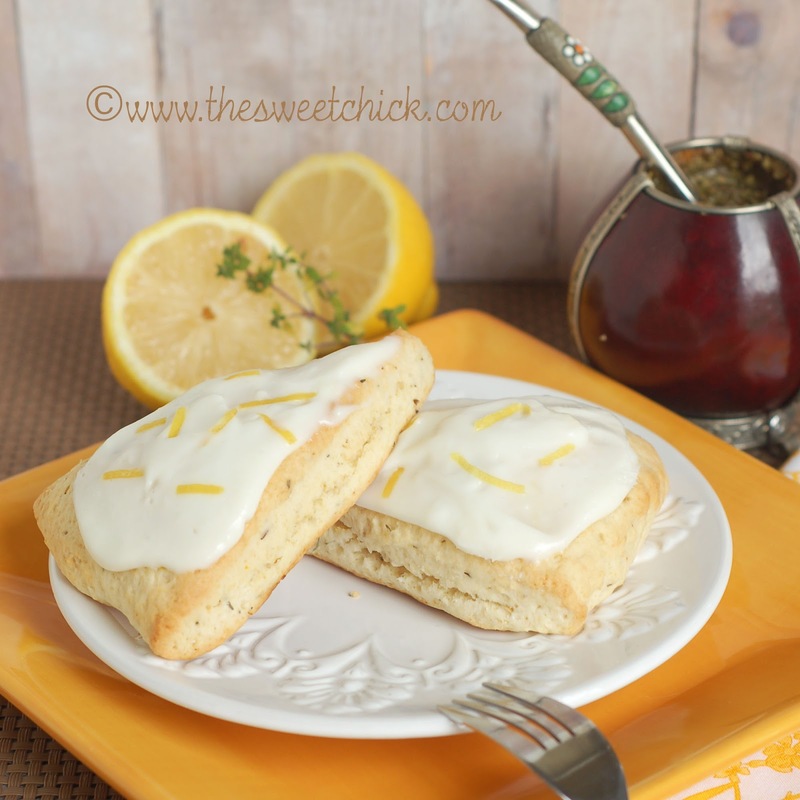 I chose lemon and thyme flavors because sometimes I need a snack a bit more on the savory side, especially if I am drinking yerba mate with my in-laws. Most of these ingredients probably already exist in your pantry and fridge, so you can make them tonight. I love the smell of lemon zest. Sometimes my sister-in-law throws some in the yerba mate kind of like adding lemon to a tea. It really enhances the flavor of the yerba leaves. 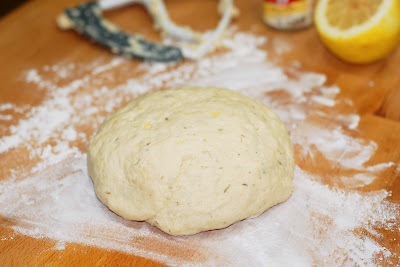 Just look at this pretty ball of dough all decorated with lemon zest and thyme leaves. You really don't need to put down a lot of flour, so the mess is minimal. If you roll it out on a cutting board, you can rinse is off in the sink and wipe it down with a sponge. If you use a pizza cutter, the pieces of dough will come out more uniform and you will get nice clean edges. I hope everyone on the East coast stays safe during this storm. We will probably be heading to the basement later today. See you all later. By hand or with a stand mixer, mix flour, sugar, and baking powder. Cut up butter and add to flour mixture. 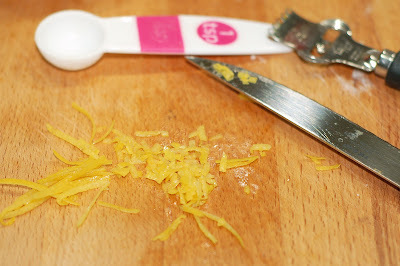 Add lemon zest, lemon juice and thyme, continue to mix until all is well incorporated. The batter will be a dough like consistency. Take the dough and roll it into one big ball. Place the ball onto a lightly floured surface and flatten out to about an inch thick. 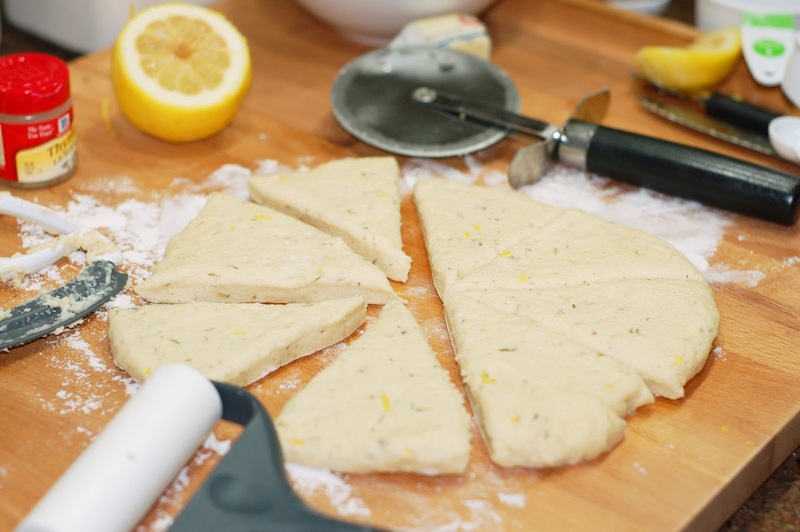 With a knife or pizza cutter, divide the dough circle into equal triangles. I made eight big scones, but you can make 10 smaller ones if you like. Bake at 425º F for 15 minutes or until tops are golden. Then take out of oven and place on a cooling rack. With a mixer, blend together cream cheese and powdered sugar until smooth. 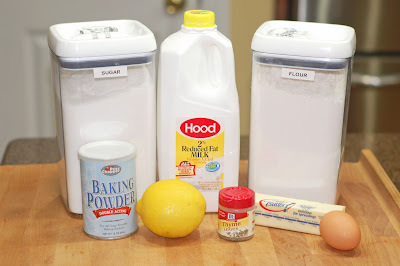 Then add lemon juice, milk, and shortening and mix well. If you want the glaze to be thinner, add a little more milk. I made mine a bit on the thick side. Spread the glaze onto the cooled scones and sprinkle with extra lemon zest if you like. These sound wonderful! I love how you used thyme in them! Thanks, we are watching The Weather Channel now and hoping for the best. These sound interesting...in a good way! 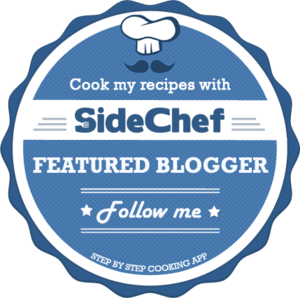 I would love to try this recipe. I made scones for the first time the other day, but I don't think they were this pretty! 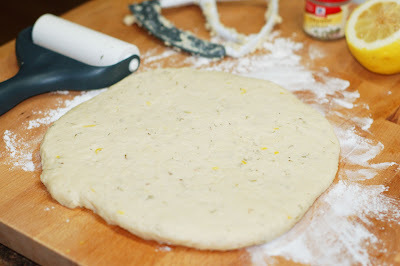 I really like making things with herbs, like rosemary shortbread cookies. Are there any other herb desserts you've tried/like? Thank you Katie. I have not tried any other herbs in desserts yet, but I have some ideas.